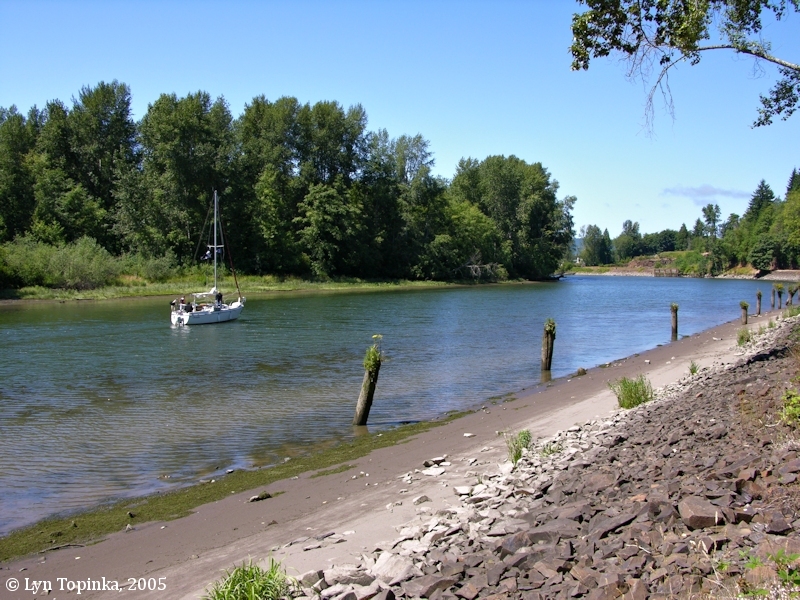 "Elochoman River and Slough, Washington"
Click image to enlarge Elochoman River, Washington. Looking downstream. 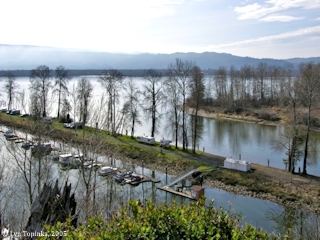 View from the Julia Butler Hansen Wildlife Refuge Headquarters. Image taken July 28, 2005. The Elochoman River heads in Elochoman Lake and flows southwest to merge with Elochoman Slough about 2 miles north-northwest of Cathlamet, Washington. 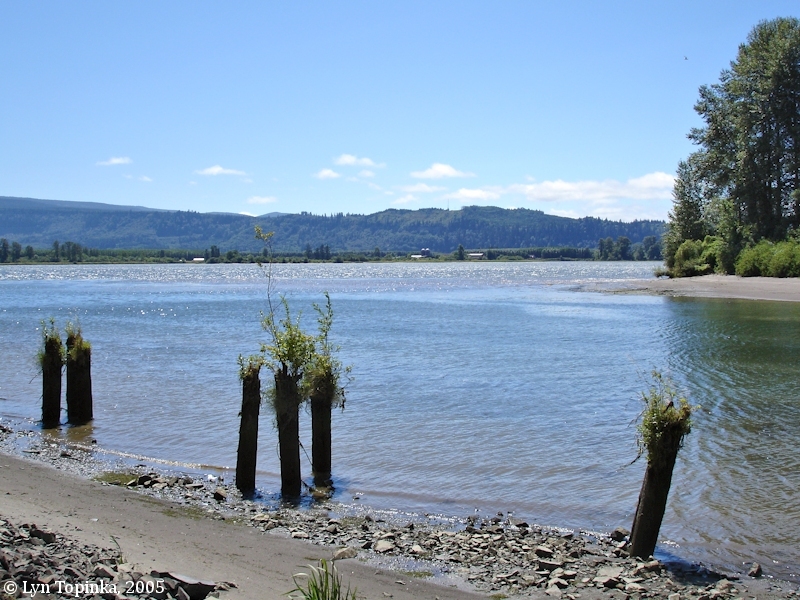 The Slough then merges with the Columbia River at River Mile (RM) 36 at the town of Cathlamet. 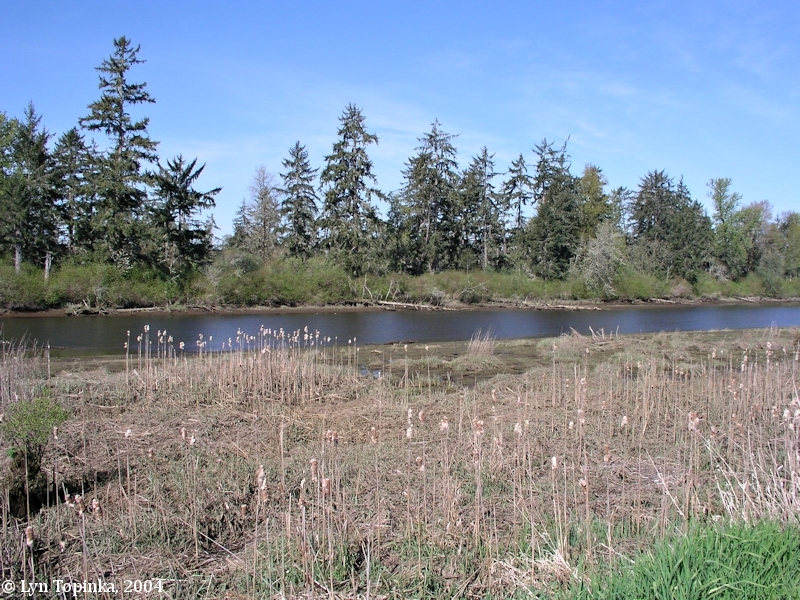 The Elochoman Slough begins at Cathlamet, Washington and flows through the Julia Butler Hansen Refuge, separating the Hunting Islands from the Washington shore. The mouth of the Slough ends at Hornstra Beach. 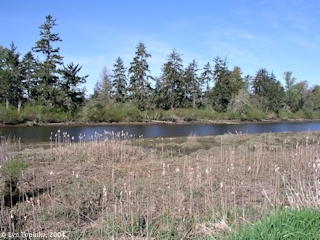 Views of the Elochoman Slough can be had following Steamboat Slough Road. The Elochoman River is named after the Indian name for the river. "... The many names have been applied to this river indicate the difficulty of translating Indian names into English. In 1841, Wilkes charted the stream as Oluman Creek. Other spellings that are of record include: Alockaman, Alochaman, Alochoman, Alokomin, Elochoman, Elockamin, and Clokoman. An early pioneer name was Strong's River. ..."
In 1841 Charles Wilkes of the U.S. Exploring Expedition called today's Elochoman Slough "Oluman Creek" and he called nearby Skamokawa Creek "Pimeca Creek". 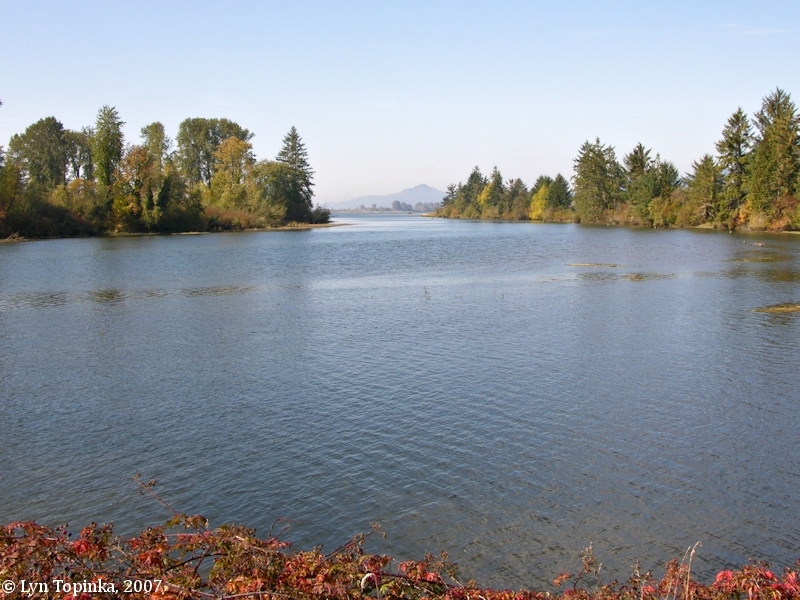 The 1871 cadastral survey (tax survey) for T9N R6W has the Elochoman River labeled as "Strongs River", Elochoman Slough as "Cathlamet Slough", and today's Hunting Islands were shown as one island and labeled "Cathlamet Island". The 1881 "Map of the Department of the Columbia" by the U.S. Army Corps of Engineers has the river labeled "Strongs River". In 1960 the U.S. Board of Geographic Names made "Elochoman River" and "Elochoman Slough" the official spellings. This reversed the 1916 ruling on the river which had made "Elokoman River" the official spelling. 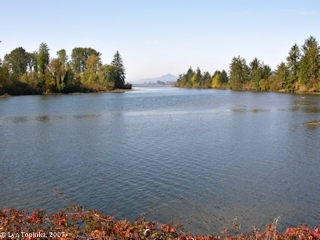 Click image to enlarge One of the Hunting Islands and the Elochoman Slough. As seen from the Julia Butler Hansen Refuge. Image taken April 9, 2004. 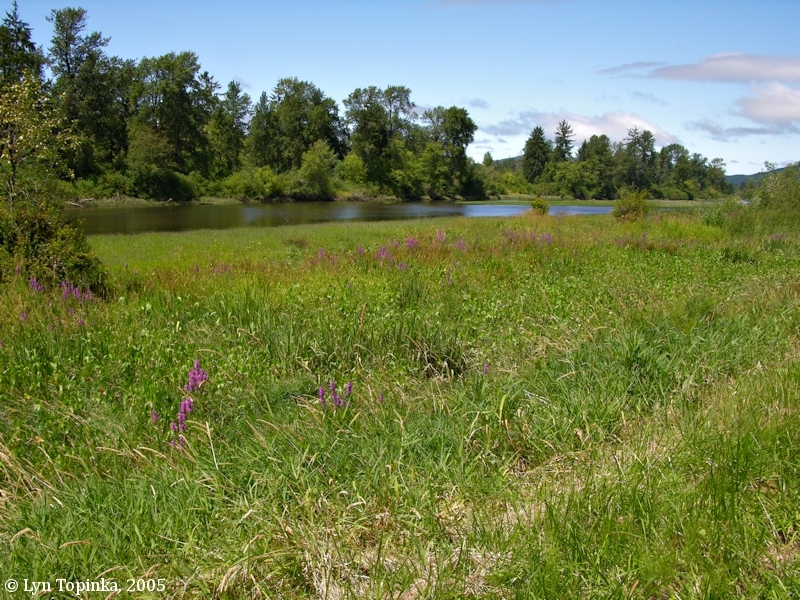 Click image to enlarge Head of the Elochoman Slough at Cathlamet, Washington. Image taken July 28, 2005. 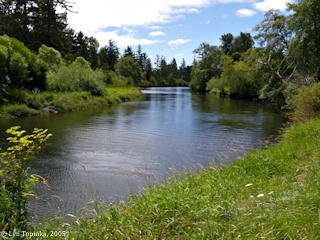 Click image to enlarge Looking downstream from head of the Elochoman Slough at Cathlamet, Washington. Image taken July 28, 2005. 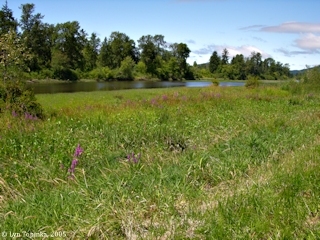 Click image to enlarge Elochoman Slough at Cathlamet, Washington. 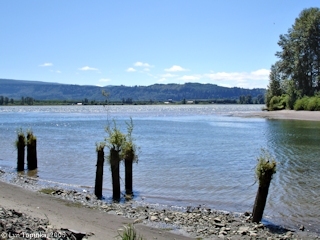 As seen from downstream along Washington State Highway 4, where the Elochoman Slough splits from the Columbia River (background). Cathlamet, Washington, is to the left, and the Cathlamet Marina is in the foreground. Image taken March 5, 2005.